2/6/95 – Pauline took the kids and Louise to Bushy Park in the afternoon. 3/6/95 – I got up with Susanna around 7.45. Took Sean and Susanna out to the shop, Susanna mainly in her buggy, Sean on his bike … [later] Pauline and Sean went to see a film called Little Rascals in Stillorgan. 8/6/95 – Pauline went with a playschool group to the zoo, taking the car. Susanna went too, and Sean of course … [later] At 8 we left Sean and Susanna over to Marnia and went to a parents’ meeting at St Attracta’s, to be told everything we needed to know about Sean’s school start. It was good – we also had a look around, and were suitably impressed. 10/6/95 – We all went to the dump and dumped the carpet … Sean and Susanna were at the birthday party of John, son of Joe and Linda from across the road … [later] Sean played with Elaine and Louise, and later was very tired and difficult to get to bed. 11/6/95 – Pauline took Sean and Susanna into town – there’s some sort of International Children’s Day parade. 15/6/95 – Sad news this morning – Rory Gallagher (the great Rory Gallagher) has died. 16/6/95 – I wrote a tribute to Rory Gallagher, which I later faxed to the Guardian. 22/6/95 – Pauline drove Sean, Louise, Susanna and myself to the nearest park and collected us. 27/6/95 – [in Donegal] Liam, Pauline, Sean, Susanna, Sian and I went to the top of the peninsula and found a beach with lovely sand dunes that could be rolled down etc. 28/6/95 – This was the day we went to Tory. We left quite early and caught the 11.30 ferry from Magheraroarty. We were brought out to the ferry in a small boat. This was all very exciting for Sean in particular. As we pulled in to Tory Susanna was looking over the rails, shouting ‘Batman!’ We walked from the east end of Tory to the west – it’s a lovely place. 2/7/95 – In the afternoon we, with Nuala, Peter and Keelin, went to the Táin Centre in Omeath, which was good fun. Sean had great fun coming down a water chute. 4/7/95 – Sean sawed clamped pieces of wood with an ordinary saw – he’s extremely quick and good at it. 6/7/95 – Olivia was in playing; we took Sean, Susanna and Louise for a walk around the block. 10/7/95 – Pauline and the kids went to the zoo and had a great time. Susanna especially liked the hippo, and tried to get it to come to her by using her strategy for calling dogs or cats. 12/7/95 – Peter did a lot of work in the front room – he’s installing a couple of double sockets up the wall, away from the new skirting boards – helped by Sean. 13/7/95 – Peter and Sean are working in the front room. 14/7/95 – A cheque arrived in the post from the Guardian – my appreciation of Rory Gallagher had been published on 22 June. We watched an Old Grey Whistle Test from 1976 featuring Gallagher. 15/7/95 – Pauline had a hair appointment in the Nutgrove at 11, then went into town. She was having a ‘day off’ from the kids. I minded them, and took them and Louise and Elaine to the nearest park. It rained and we got wet. 16/7/95 – My dad rang to say that his brother Charlie had died today – this was sad news. Charlie was always good company and good fun … [later] Sean and Susanna went to sleep relatively early (Sean can now join in with some of the words of ‘The Big Strong Man’). 19/7/95 – We and Olivia went to Marley Park – it was a lovely evening. 22/7/95 – Pauline took Sean to see 101 Dalmatians in Stillorgan in the afternoon. 24/7/95 – Took the kids and Olivia to XtraVision, Sean and Olivia being on their bikes. 27/7/95 – Saw a pit bull terrier grab a Jack Russell, which was pretty horrific. Pauline was upset and went back to see that the Guards were being notified and so on. The Jack Russell was bleeding but alive. 29/7/95 – … Figaro (Sean named the second kitten, with a little secret help from Pauline) … [later] Sean got lots of presents from his cousins. He was also introduced to computer games. The girls played their tin whistles for us, very well. 30/7/95 – The kids slept on the way home, after Sean had insisted on having ‘Buffalo Soldier’ played twice so that we could join in with the ‘Woy-oy-oy’ bit. 31/7/95 – Sean has been fighting with Elaine and Louise a lot, and we don’t see as much of them as before. 1/8/95 – We all went to the park, with Olivia. Sean’s chain kept coming off his bike. 3/8/95 – We all went to Dun Laoghaire and had a walk on the pier – it was beautiful, and a beautiful evening. I got the guitar out of the attic – I’ve decided to take it up again and to take lessons, inspired by the Dubliners. Pauline says she will learn it too. 4/8/95 – We decided to go to Dun Laoghaire again. Couldn’t go all the way down the pier because Michael Collins was being filmed there. 5/8/95 – Took Sean, Olivia and Susanna to the park, where Sean and Olivia had a go (Sean had two goes) on the model railway. 6/8/95 – In the afternoon we all went to the Powerscourt waterfall – the area was very crowded, unfortunately, but we had a good time anyhow. 8/8/95 – Another fine day – Pauline, Sean and Susanna went to the zoo. 10/8/95 – I took Susanna for a long walk – Sean had gone to Vivienne’s house with Aileen and Olivia. The hot weather continues … [Later] Sean and I tried out the ‘Paintbox’ on the computer. 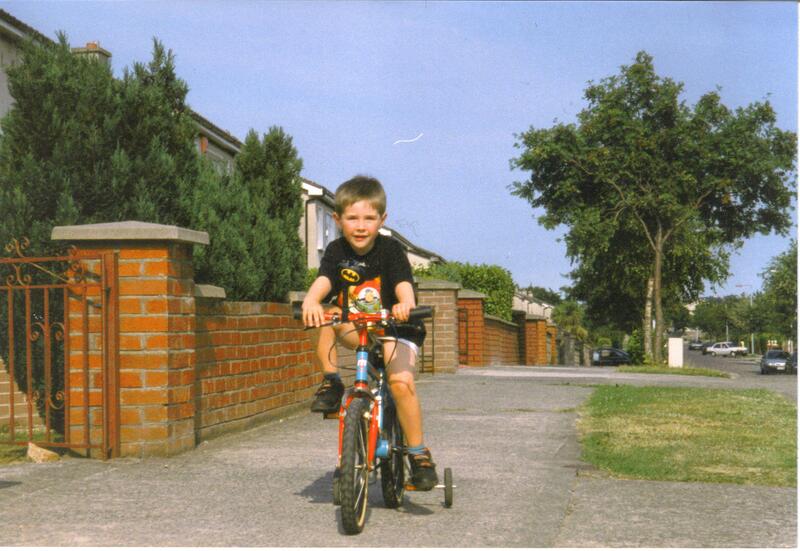 29/8/95 – Walked home via St Attracta’s to see Sean’s name posted up on his classroom door with the others. 30//8/95 – Sean tried on his school uniform, and looked very good in it. I’d like to read your tribute to Rory. Hi Milo … thank you. I have a hard copy of it somewhere; I’ll type it up and upload it as a blog post here. I’ll try to do this in the next couple of days, and will email you when it’s up. Thanks. I’m a big fan of Rory!